Volunteer, and it will CHANGE YOU! About 25 years ago, I was dating a guy who was very involved in the sport of triathlon. I remember thinking there was no way I could ever do a triathlon because I wasn’t a strong swimmer. One weekend he was participating in a triathlon so I decided to volunteer at the event. I remember handing out water at the aid station and seeing all these people of different ages, body shapes, fitness levels, some with physical ailments and disabilities and it completely inspired me. And that was the start of my love for the sport of triathlon. I signed up for a swimming program, got a coach and learned how to swim. I’m still not a super-fast swimmer but I can swim for a very long time without feeling like I’m going to die! I did my first triathlon shortly after and I was hooked. That summer I immersed myself in the triathlon community and did an event every weekend! I love the energy and surrounding myself with people who are committed, disciplined, determined, focused and reaching for their best. I’m a true believer in the statement “you are who you hang with” so if you want to be inspired then surround yourself with people who are inspirational and challenging themselves. Soon you will find yourself doing the same! Don’t forget to sign up to automatically receive my new blog posts….right up here! Over the last 4 weeks, we’ve reviewed all the ins and outs of the sport of Triathlon and provided specific training tips. So hopefully you’re now inspired to try your first Triathlon this summer and will join us for the Girlfriend & Dudes Triathlon or Duathlon on July 20th to support the Children’s Center. Today we are going to tackle some specifics of program design to help you plan your training week. Over the last 2 weeks, we’ve discussed the sport of triathlon and provided some tips for the most dreaded leg of a Triathlon, the swim. Now that we’ve got that behind us hopefully you’ve all been inspired and realize that you can get to the finish line of a Triathlon THIS summer. Yes, you can do it! Last week we discussed the various distances in the sport of Triathlon. My hope is by the end of this series, a large number of you will be inspired to try your first Tri this summer! And nothing will bring me greater joy than to know I helped you get to the finish line! The sport of Triathlon is on the rise with three times as many races popping up across the country. The greatest increases in participation are seen in the 30+ age group as this demographic is looking for a personal challenge and a way to stay in great shape. 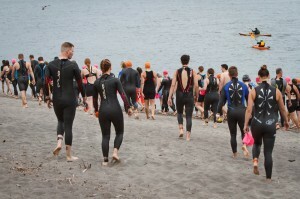 The swim, bike, run event is cross-training at its best and offers a healthy, active and fun culture and community.